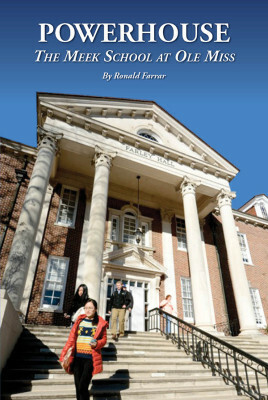 Powerhouse: The Meek School at Ole Miss, by Ronald Farrar, is a history of the University of Mississippi Journalism Department from 1947 to the present. In these pages we see how a worthy academic and professional program evolved from a department to the Meek School of Journalism. Powerhouse: The Meek School at Ole Miss, by Ronald Farrar, is a history of the University of Mississippi Journalism Department from 1947 to the present. In these pages we see how a worthy academic and professional program evolved from a department to the Meek School of Journalism. In the beginning, journalism at the University of Mississippi started out small and humble, just an old printing press in ramshackle quarters. The first professors were a couple of veteran newsmen who knew how to write and plucky, talented, eager students a combination which developed its own kind of magic. We meet Gerald Forbes, the man who founded the journalism department, and the men and women who nurtured it. Ed Meek, an alumnus and benefactor, did much to propel it toward the top tier in its field. It s a remarkable story, told authoritatively and graced with traces of humor along the way. Author Ronald Farrar served as chairman of the University of Mississippi Journalism Department from 1973-77. He is the author of eight books and numerous articles for academic and professional publications. When he retired in 2001, he was Reynolds-Faunt Memorial Professor and Interim Dean of the College of Journalism and Mass Communications at the University of South Carolina.